Considering they are the oldest recorded house of the Champagne region – founded in 1584 by Pierre Gosset – the 21st century house of Gosset is also one of the more innovative in the region, releasing a one-off ‘experimental’ Blanc de Noirs which I reviewed last year, made from Pinot Noir, and aged for a full eight years in the cellars before release. Only 10,000 bottles of that wine were created, and this month a sister wine has been released, but this time with only 5,000 bottles. 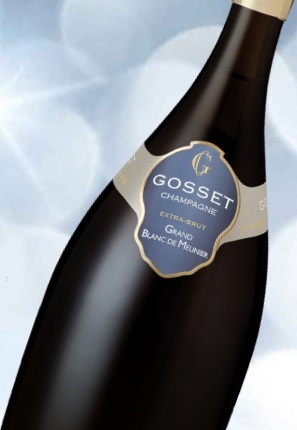 The Gosset Grand Blanc de Meunier is made solely from the Pinot Meunier grape. Like the Blanc de Noirs, this cuvée is based on the 2007 vintage, so has had one extra year on the lees, and a lowly 3g/l of residual sugar as opposed to the Blanc de Noirs’ 5g/l. Pinot Meunier is one of the three main Champagne grapes, and in terms of quantity, equally important with around 31% of all vineyard plantings. But most Champagne authorities regard it as inferior to Chardonnay and Pinot Noir, especially in terms of its capacity to age. It is prized mainly for its fruitiness and because it ripens earlier than the other varieties, which is a definite bonus in the marginal climate of Champagne. For that reason it is seen as a very ‘useful’ variety rather than a great one, and as a blending component, rarely taking centre stage. The fruit for Gosset’s new cuvée has been sourced from vineyards around the town of Epernay, mostly coming from Premier Cru sites, where it is planted alongside Pinot Noir. However, Pinot Meunier is not allowed Premier (or indeed Grand Cru) status, even when planted within these vineyards. Gosset cellarmaster Odilon de Varine selected Meunier from mid-slope, south and east-facing sites, and vines that were between 25 and 30 years old. Malolactic fermentation was blocked, and some Chardonnay lees (the soup of dead yeast cells left after fermentation) were added to bolster the Pinot Meunier’s freshness and ageability. The result is a fascinating and rare expression of pure Pinot Meunier Champagne, with the golden-hued tones of its long ageing, lovely fruit and considerable length. It’s expensive and will be hard to find with only 5,000 bottles for the world market, but fizz afficionados will surely be very keen to try it for themselves. At time of review the only UK stockist I’m aware of is The Whisky Exchange at £84.95, though French Champagne specialist Plus de Bulles will ship inside Europe for 12,99€ and their price is 71,95€. (2018) A one-off and exceptional wine from Gosset, 100% Pinot Meunier, aged for a full nine years on the lees in Gosset's cellars. The base vintage is 2007, with 10% reserve wines added. The Meunier comes from south-facing vineyards around Epernay, and it is very dry with only 3g/l of residual sugar. The colour immediately speaks of the age of the wine, a burnished yellow/gold, then very fine bubbles and a cushion of mousse, revealing lovely biscuit and toast and a yellow plum fruitiness. It is full and charming. In the mouth it is expansive and creamily rich, the mousse quite luxurious, and the pitch of the acidity - very noticeably saline - gives great freshness to the toasty, creamy, weighty fruit. Just lovely and a real treat to taste a truly exceptional Champagne.